SACOG is working on the 2016 update of the MTP-SCS (Metropolitan Transportation Plan / Sustainable Communities Strategy) or Greenprint, with the draft having been out for a month and the deadline for comments on November 16. The last of the public meetings will be held tomorrow, Tuesday, November 10, 6:30-7:30PM, at SACOG Offices, 1415 L Street, 3rd Floor, Sacramento. I hope you can attend. I have been part of a 350Sac Transportation Committee effort to review the document. I’ve reviewed parts of it, Chapters 1, 4, and 5C, and Appendix A, but have not had the time to review the whole thing – it is massive. The comments below are my own, not the committees. Your comments on the plan are welcome and important. If you can’t tackle the whole plan, pick a small part of interest to you, and comment on that part. Tomorrow (Monday) an open house / community meeting will be held on the Sacramento Grid 2.0 project which aims to improve transportation in the downtown/midtown area of Sacramento. I attended the stakeholder meeting October 20, and had input leading up and as a result of that meeting, but then forgot to post. Thank you, Ken Petruzzelli for reminding me to post. The stakeholder meeting was all about the maps of each component (pedestrian, bicycling, transit, and others), gathering feedback about what works and what doesn’t. Of course with physical maps you can’t overlay different layers to see what the correlation is, but the facilitator at my table did a good job of relating the layers. The maps have not been made available to the public yet, and what you see on Monday could differ from those shown at the stakeholder meeting. Significant issues in my group (there were six groups) were: whether bike lanes on both sides of one-way streets made sense, with the consensus being that they were not needed except in special circumstances of heavy bicyclist traffic turning left; whether the two-way cycle-track (separated bikeway) on N Street between 3rd and 15th would work well at intersections in the western part; and that nothing in the plan seemed to address a reduction of signals and stop signs throughout the grid that would improve transportation flow and actually reduce speeding. The map approach at the stakeholder meeting left out that which isn’t spatial – policy. I think policy to support the transformation is at least as important as which streets are changed. What follows is a list of policy issues that I think must be addressed in the plan. The lead article this week in the Sacramento News & Review is Sacramento’s report card. I can’t resist getting in on the fun. The article covers bicycle transportation in the “On two wheels” paragraph, and does it pretty well, giving a C grade. I’d add that art bike racks can be fun if they are also functional. 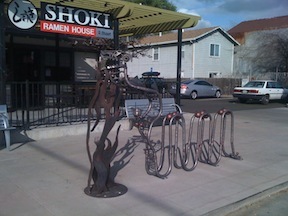 The dragon at Shoki Ramen House and the bottle openers at New Helvetia Brewing are good examples. I think bicycling really works pretty well in the central city and some of east Sacramento, with people getting along in sharing the road most of the time. The further out you go, though, the worse things are, with belligerent drivers traveling at high speeds. I’d give central city a B and the far suburbs an D-. Does this average to a C?